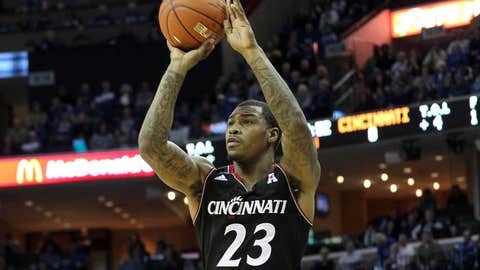 Cincinnati Bearcats guard Sean Kilpatrick had 18 points for the Bearcats on Saturday. MEMPHIS, Tenn. (AP) — Sean Kilpatrick scored 11 of his 18 points down the stretch and Cincinnati overcame early shooting woes to beat No. 18 Memphis 69-53 on Saturday. Kilpatrick’s scoring surge provided enough of a buffer to extend Cincinnati’s winning streak to six straight, while Memphis saw an end to a three-game winning streak. Justin Jackson finished with 13 points on 6-of-10 shooting, eight rebounds and a career high-matching seven blocks for Cincinnati (13-2, 2-0 American Athletic Conference), while Shaquille Thomas had 10 points. Joe Jackson led Memphis (10-3, 1-1) with 13 points, but only had two in the second half. Michael Dixon added 12 points but was 4 of 12 from the field. Cincinnati Bearcats guard Sean Kilpatrick attempts a shot during the first half against the Memphis Tigers at FedExForum. Cincinnati broke open a close game in the latter stages of the second half as Kilpatrick began scoring and Memphis was stymied with 24 percent shooting in the final 20 minutes. Cincinnati used a 13-3 rally to extend the lead to 52-42. Eleven straight points by Kilpatrick ran the lead to 69-51 with about a minute left, but many of the Memphis fans already were headed for the exits. The Bearcats, who were hovering under 30 percent shooting in the first half, connected on 14 of 24 shots in the second half, including missing only one of their five shots from outside the arc. Memphis was hindered by 16 turnovers and going 2 of 17 from 3-point range for the game despite relying on its four senior guards. In many ways, Cincinnati outhustled Memphis in getting to loose balls and showed energy, especially in the second half. Cincinnati used a late rebound basket by Kevin Johnson to take a 27-26 lead into halftime, despite shooting 33 percent. The lead was Cincinnati’s only one of the half. There were three ties. Jermaine Lawrence’s six points were the most by a Bearcat in the first half while Jackson had 11 points to lead Memphis, which was hindered by eight turnovers. While Jackson was 5 of 6 from the field, the rest of the Tigers were a combined 7 of 20. While Memphis scored 18 of its 26 points in the paint, they had little outside shooting to loosen the Bearcats defense. Memphis missed six of its seven shots from outside the arc in the half, a sign of things to come. Cincinnati outrebounded Memphis 20-15 in the first half and that included nine offensive caroms, leading to a 10-0 margin in second-chance points. Memphis outrebounded the Bearcats 41-38 for the game.